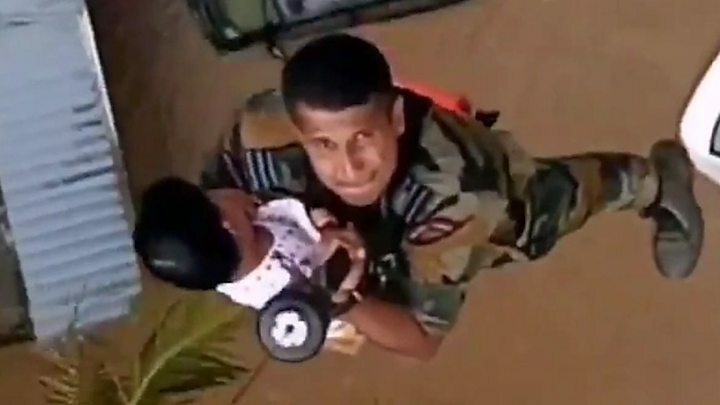 India's air force and navy helicopters are airlifting stranded people from rooftops, and dropping food supplies to those they cannot yet reach. A local politician, Saji Cherian, broke down in tears on TV on Friday describing the crisis there. "Please give us a helicopter. I am begging you. Please help me, people in my place will die. Please help us. There is no other solution, people have to be airlifted," he said. On Sunday, the state's chief minister Pinarayi Vijayan vowed "to save even the last person stranded". Hundreds of government boats have been deployed across Kerala to aid the rescue. The BBC's Yogita Limaye, in Kerala, says the coastal state's many fishermen are providing valuable support, using their own boats to help the relief mission. "They were the scariest hours of our life," 20-year-old Inderjeet Kumar told the AFP news agency from a church shelter in the stricken Thrissur district. "There was no power, no food and no water - even though it was all around us." The state's chief minister Pinarayi Vijayan tweeted on Friday that 314,391 people were being housed in 2094 camps across Kerala. India's Prime Minister Narendra Modi surveyed the state from the air on Saturday, and has promised an immediate grant of 5bn Indian rupees (£55m; $71m). Far from the swirling waters, worshippers in the Vatican were pictured with signs reading "Pray for Kerala" as they gathered for Sunday prayers. "Our brothers should not lack our solidarity or the concrete support of the international community," Pope Francis told the crowds. Are you in the flood affected areas in Kerala? If it is safe for you to do so, email your story to haveyoursay@bbc.co.uk.